The early history of this house is linked to that of its neighbours as the six houses which are now numbers 32 to 42 Castle Street were all built by the same person, Joseph Parslow. Richard Sargent. The 1841 census shows that Richard Sargent was a wheelwright aged about 25 and his wife Sophia was about 27. They had a daughter Fanny aged 18 months. The family has been hard to trace – partly because there are so many spellings of this surname. The 1841 census spells it “Sarjent” and the other records have other variations. Please note that we have used this version just for consistency. Richard married Sophia Boulton in Bristol on 30th September 1838. The birth of their daughter Fanny was registered in Thornbury in the September quarter of 1839. They had three other children while they were in Thornbury; Thomas Sargent was baptised in Thornbury on 11th July 1841, Mary Jane was baptised on 26th April 1846 (she may have been three at the time) and Henry Sargent was also baptised on 26th April 1846. By 1851 the family had moved to Manchester. Richard Sargent was now 33 and a joiner who was born in Iron Acton in Gloucestershire and Sophia was 34. Fanny was eleven by this time; Mary Jane was eight and Henry six and three year old Eliza was born in Sheffield. In the 1881 census they were living in Eckington in Derbyshire. Richard was a wheelwright aged 64 and Sophia was also 64. Living with them at the time of the census was their granddaughter Clara Hendy aged 21. The Salmons – the 1859 rate book shows the property was occupied by ‘Mrs Salmon’. The 1861 census shows that Mary Ann Salmon then aged 22 and working as a grocer, was sharing the house with her brother Richard a painter aged 18. Mary Ann was baptised in Bruton in Somerset on 7th October 1838. Richard was baptised in the same place on 14th December 1842. They were children of John Salmon, a foreman in a silk factory and his wife, Frances. In 1861 Mary Ann and Richard had a visitor Jane Hore aged 26 from Appledore in Devon. Mary Ann Salmon was still listed as the main occupant in the 1862 rate book, but by 1867 she appears to have left. We can’t trace Mary Ann in the 1871 census. In 1881 Mary Ann Salmon was a lady’s maid in Wentworth House Clevedon for Mary Ann Bromley. By 1891 she was with her mother in Bank Cottage, Castle Street with no occupation. The rate books of 1894 and 1899 show Mary Ann Salmon was living at at 7 Gloucester Road. She eventually went to live in the almshouse at 9 St Mary Street. Mary Ann died in Thornbury Union Workhouse aged 65 and was buried in Thornbury Cemetery on 3rd September 1904. Richard Salmon had taken over from his sister Mary Ann as the main tenant of Elizabeth Cole at 32 Castle Street by the 1867 rate book. On 10th October 1864, Richard married Caroline Howes at St James Church, Bristol. We understand from a family website on the Internet that Richard was living at Montague Street in Bristol at the time of their marriage. Caroline was born in Thornbury about 1841, the daughter of John Howse an agricultural labourer from Kington and Emma his wife. Richard and Caroline must have probably taken over the occupancy of 32 Castle Street from Richard’s sister soon after their marriage. A report of the sale of property at 32 Castle Street which appeared in a newspaper of 17th September 1870 refers to “lot 2 All that Freehold Messuage or Dwelling-house with walled gardens and premises situate in Castle Street Thornbury in the occupation of Mr Richard Salmon”. The 1871 census shows that Richard, a painter, and Caroline, a dressmaker aged 29 born in Morton were still living in 32 Castle Street with Emily aged 5, Edwin John aged 4, Ellen aged 2 and Selina aged 1. The 1876 rate book and the 1881 census show the Salmons had moved to 7 Pullins Green. The 1881 census shows Caroline was a dressmaker. They had Emily aged 15, Edwin, a painter aged 14, Ellen aged 12, Selina Caroline aged 11, William Henry aged 8, Catherine aged 6, Elizabeth aged 4, Frank aged 3 and Hector aged 6 months. Another child, Herbert George was born in 1885. Little Hector died in 1883 aged 2. Little Herbert George died in 1886 aged 1. On 27th July 1890 Ellen Salmon married Ernest Henry Bricknell, a clerk from Clifton and the son of George Bricknell, a butler. They appeared to settle live in Bristol where their two children were born. In the 1911 census they were living at 31 Monmouth Road, Bishopston, Bristol. Ernest was a law clerk. In the 1891 census Richard and Caroline were still living at 7 Pullins Green. Of their children, only Elizabeth and Frank were living with them. Frank had become a tailor’s apprentice. The 1894 rate book shows them still living in the same house. In 1896 their son, William Henry Salmon, married Elizabeth Lambert in the Pontypridd area. The 1911 census shows they continued to live in Glamorgan. Selina Caroline also married in 1896, but we don’t know the name of her husband. The 1899 rate book and the 1901 census show Richard and Caroline had moved to the smaller house at 12 Pullins Green and all their children had moved away. Their daughter, Elizabeth had become a draper’s assistant living in Leamington Spa. On 4th April 1904 Elizabeth married Frederick Shaw a draper’s assistant from Witton in Wiltshire. In the 1901 census Richard and Caroline’s son, Frank, was a tailor boarding in Herbert Street, Newport. Richard and Caroline were shown as still living at 12 Pullins Green in 1909/10 when they were paying a quarterly rent of £2 7s 6d to Frederick Henry Burchell, but they must have moved away shortly after as Robert Mills is occupying the house in 1910. The 1910 rate book and the 1911 census show that Richard and Caroline had moved again, this time back to 28 Castle Street. They were occupying two rooms of the house, which they seem to be sharing with their son Edwin. At the time of the census Richard was described as being an ‘Invalid formerly painter’. Richard died on 31 October 1920 aged 77 years. His death was registered in Thornbury. Caroline died at 200 Newfoundland Street, Bristol on 19 January 1922 aged 80 years. They are both buried in the Non-Conformist section of Thornbury Cemetery. John Powell. In the rate books of 1876 and 1877 John Powell lived in the house owned by Henry Knight. We are not certain which John Powell this was. Edwin and Elizabeth Bevan. 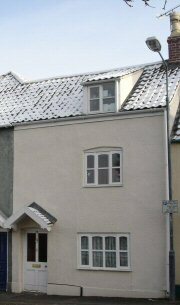 By the rate book of 1878 and 1880 Edwin Bevan was shown to be the tenant of 32 Castle Street. The census of 1881 shows that they were Edwin and Elizabeth Bevan. Edwin was a mason aged 58 born in Thornbury and Elizabeth, his wife was 60 and she was born in Chew Magna. Edwin Bevan was born about 1823 and was baptised on 1st July 1827. He was the son of James Bevan junior and his wife Anne nee Ann Lippiatt Thomas. In the 1841 census Edwin was an apprentice mason living with his parents at 1 High Street. Edwin was the eldest of the four children then living at home. Edwin Bevan married Elizabeth Trotman in the March quarter of 1845. Elizabeth was born in Chewton Magna about 1820, the daughter of William and Sarah Trotman who had moved to Oldbury. They had several children: Edwin born about 1847, Elizabeth born about 1850, Alfred born about 1853, twins, Frank and Jane, born about 1855, Mary Jane born about 1860, Arthur born 1861, Ernest born about 1862 and another Arthur born about 1865. By 1851 Edwin was a journeyman stonemason aged 28 and Elizabeth aged 30. They had two children, Edwin aged four and Elizabeth aged one. They were living in an unidentified house in the area of Pullins Green. Living with them were a “visitor,” her widowed brother, Samuel Trotman an agricultural labourer aged 24 and their two eldest children. They had several children: Edwin born about 1847, Elizabeth born about 1850, Alfred born about 1853, twins, Frank and Jane, born about 1855, Mary Jane born about 1860, Arthur born 1861, Ernest born about 1862 and another Arthur born about 1865. By the 1861 census the family had moved to 36 Castle Street. By 1869 the family had moved from 36 Castle Street. We believe at this time the family may have been living next door to The Chantry in Castle Street in a property now called Wellbourne Cottage. Thornbury Journal and West of England Monthly Illustrated of March 1870 carried an interesting advertisement for “Edwin Bevan Junior, Castle Street, Thornbury Tuner of the Piano Forte, Harmonium and Reed Instruments. Tuning by the year or otherwise.” This does not to have become Edwin’s main profession as by the 1871 census Edwin junior had become a mason like his father. His brother Frank had become a “writer”, and Jane was a servant. They seem to have moved to 32 Castle Street in 1878. By 1881 there was just Edwin and Elizabeth living at their home in 32 Castle Street. Edwin died aged 62 on 8th January 1887 and was buried in the burial ground of the Congregational Church. William Symes. The 1890 rate book shows that William Symes now lived in the house which was still owned by Henry Knight. The 1891 census shows that William Symes a tailor from Shepton Mallett aged 75 was living with his wife Matilda aged 74 a dressmaker. Also in the house was their daughter Matilda Brown with her son William aged 6 and Daniel Smith a lodger aged 22 who was a gardener from Rockhampton. They lived in four rooms. Matilda Brown. The 1901 census shows that the house is occupied by Matilda Brown. Matilda, the daughter of William and Matilda Symes had married John Brown a printer and son of John Brown a printer on 7th August 1884 at St Mary’s Church in Thornbury. She described herself as a “wife” but there is no evidence that she was living with her husband. Matilda was a 45 year old laundress living in four rooms with her son William aged 16 who was apprenticed to a saddler and Edith aged seven who was still at school. They had a lodger Henry Maishment, a groom aged 26. They were all born in Thornbury. The 1911 census shows that Matilda Brown had been married for 28 years and had two children. She was a laundress with two lodgers Lillian Power aged 8 who went to the National School and Victor Kerslake who was a groom for the Mundys. Matilda died in Southmead Hospital aged 73. She was buried in Thornbury Cemetery on 28th September 1929. Annie Kendall. The register compiled in 1939 in the advent of war shows that the house was occupied by an unmarried lady called Annie Kendall who was born 21st January 1881. Annie was said to be ‘incapacitated’ and living with her was a widow called Sarah Skuse who was born 20th October 1865. Sarah was said to be doing “unpaid domestic duties”. The electoral register of 1935 shows that Annie Kendall was living in the house at that time. Annie was baptised on 6th March 1881 at Hill, near Thornbury and her parents were Charles and Frances Kendall. Although Charles was a farm labourer, the census of 1881 shows that the family lived at a grocer’s shop in Hill. Presumably Frances was a shop keeper. Annie Kendall died in Thornbury on 31st December 1941 aged 60 probate was granted to Howard Elwell Knight, a carpenter. Denis Wilfred Thompson. We have not had access to the deeds of this house and so it is not possible to determine many of the people who lived in it from this time. However we believe that Denis and Norah Lily Thompson may have moved into the house after their marriage on July 20th 1926. The electoral records certainly show that Denis Wilfred Thompson lived in Castle Street by 1927, although his wife does not appear in the electoral roll at that time. The General and Special Rate Book of 1934 shows that Denis rented this property from H. Knight until 21st July 1934. In 1935 Denis and Lily both gave their addresses as the High Street, which implies they moved about that time. Click here to read about the Thompson family. The electoral register of 1954 has the house numbers so we know that Dora Braunton and James Braunton lived 32 Castle Street. We have no information about this couple. Eulalie Greenwood. The 1958 electoral register says Eulalie Greenwood lived at 32 Castle Street. Miss Greenwood was born in Thornbury in 1900 and died here on 5th July 1963. From 1962 we know that Florence and Fred Croker lived in the house. We have been told that they were a “religious couple who attended Mr Tily’s mission church at Rockhampton.” After 1975 Florence C Croker appears alone in the registers.